The following 95 events in 24 Latin American countries include those listed in Google during the week of September 21-28 under the key words “International day of peace”, “Dia Internacional da Paz” and “Día Internacional de la Paz” The events also includes some listed on the event map for the International Day of Peace and on the facebook pages for the global feast and the International Cities of Peace as well as partiipants in One Day One Choir and Montessori schools singing for peace. and many people dressed in white. SAN CAYETANO, ARGENTINA: For the International Day of Peace “Culture goes to the square” was developed in Plaza América, with the participation of the workshops of the Directorate of Education and Culture. In the space of the painting workshop they were able to make a production using the silk-screen technique; in loom they contributed to make the longest flag of the district; the Papelnonos built paper bulbs and cranes that were hung in one of the diagonals of the plaza, as well as they interpreted the Anthem of the Peace; whereas Danzas Latinas, Old Active and Fun, and Coro made everyone sing and dance. The Laboratory of theater, tango and folklore showed how much they learn in classes; while the rock and guitar workshops presented their newly formed bands. Everything was recorded through the Photography workshop. SAN JAVIER, ARGENTINA: In San Javier, schools 853 and 1121 carried out activities for the International Day of Peace. In the case of the public elementary school N ° 853 Fray Ermete Costanzi, there was a peace march from the educational institution to the municipal campsite. “We want to instill this value with the children, we have worked during the week in the classrooms on the subject of peace,” said the deputy director of the morning, Claudia Blanc. San José School 1121, carried out various activities related to peace, first in the classrooms and then held a celebration at the Palo de la Paz, located in San Martín Square and then went to the municipal campsite, to develop recreational activities. SALTA, ARGENTINA: The celebration in the Paseo de la Democracia of the Plaza de la Legislatura included the raising of the flag, “bandera de la paz,” an artistic show, a peace walk and a photographic exposition. SAN SALVADOR DE JUJUY, ARGENTINA: The municipality of the capital, through the Secretariat of Human Development, organized the ceremony in Plaza Belgrano, an opportunity to strengthen the ideals of peace and to release the anthem of a Jujuy author. The Secretary of Human Development, José Luis Sánchez, praised the importance of the ideals of peace of all the nations and peoples of the world, Other participants included the Secretary of Indigenous Peoples, Natalia Sarapura; Rebeca Chambi, Director of Cultural Rights; councilors Patricia Moya, María Galán, Estela Flores and Marcelo García; Ambassadors of Peace and neighbors. CORRIENTES, ARGENTINA: On Friday, September 21, the Ministry of Education of Corrientes, on behalf of Lic. Mirta Clarisa Godoy Director of Intercultural Bilingual Education participated in the commemorative act for the “International Day of Peace” in the Plazoleta located at intersection of streets May 25 and Costanera Av. of our city. The event was led by the Mayor of the city, Dr. Eduardo Tassano, who spoke to those present highlighting the importance of living in a society that uses peace as a basis for coexistence, inaugurating a peace pole “May peace prevail over the land” written in different languages ​​representative of our diverse culture. BUENOS AIRES, ARGENTINA: Organized by the Secretariat for Equal Opportunities and Treatment of the UPCN (Unión del Personal Civil de la Nación), the commemoration of the International Day of Peace, was held in the gardens of the Ministry of Economy. From 2:00 p.m. to 7:00 p.m., the gardens were decorated with hundreds of origami cranes made by children in schools, elderly people in different centers and interested people who came to the offices of the Secretariat to learn the technique and make the cranes which are symbols of peace made by the Japanese paper folding technique. BUENOS AIRES, ARGENTINA: A Global Feast for Peace was held this year in Buenos Aires. ORANJESTAD, ARUBA: UNESCO Aruba partners up with JCI Yala for a 3k fun walk to celebrate World Peace Day. TUBARÃO, BRAZIL:Representatives of 12 School participated in the 9th Meeting with Catholic Professionals of Education, on September 29, morning, at St. Joseph’s College in Tubarão. Archbishop João Francisco, in his message to the educators, stressed that peace is ” woven day after day with patience and mercy and demands a look from the heart”. Counselor, Psychologist and Educator Joyce Lima Floriano, with competence, addressed the theme: “The culture of peace in the world of the School “. PIRATININGA, NITERÓI, BRAZIL:The social action “Walk of Peace”, in celebration of the International Day of Peace, was held yesterday afternoon, at the Colégio de Aplicação Dom Hélder Câmara, in Piratininga, Niterói. The students gathered in the Plaza do Rotatória do Cafubá, and sang the song “La paz” by Gilberto Gil, leaving the people who watched with excitement. “This walk is very important, because the world today is really very violent, with shots to all sides and the walk is to make everyone aware that peace can reign at any moment,” said Ricardo Caliço, 5th year. JÚLIO DE CASTILHOS, RIO GRANDE DO SUL, BRAZIL: With the purpose of disseminating a culture of non-violence in schools and society through work carried out in schools and outside of it, EMEI Dona Doralice promotes a walk next Wednesday (19), at 14:00, which happens on the street Cel. Luiz Azevedo in the neighborhood Centro Baixo in front of the school is located in Júlio de Castilhos, within the “Peace Project is People Who Do”. The direction, CPM and students of the school, invite state schools and entities such as Santo Antonio Beneficent Association and community members to participate in the ‘Walk for Peace’ where everyone can wear white clothes. ARAPIRACE, BRAZIL: Students from Lindalva Elementary School Eulália de Farias marched on the streets of the Bom Sucesso neighborhood on Friday (21), International Day of Peace, to ask for “enough” in the violence and to shout for justice. During the week several activities with this same theme were carried out inside the school, including with the presence of the parents, as poster contest and parodies. CAMPINAS, BRAZIL: This Friday, September 21, starting at 4:00 p.m., in Praça da Bandeira in Campina Grande, the United Religions Initiative – Uri Borborema Cooperation Circle, will celebrate the International Day of Peace, with the presence of several leaders and representatives of religious institutions and groups in the city, with messages and prayers for world peace. The event will feature musical performances MaracaGrande and Viviane Stayner, distribution of about 200 mini-ykebanas and 200 kitcharis – vegan snacks, and will still be made a ThetaHealing healing wheel for unconditional love giving. CHAPECÓ, BRAZIL: The Chapecó / SC Choral Association marked the International Day of Peace at the Regional Police Station of the Civil Police and the Chapecó District Forum, with brief concerets in order to carry the message that marks the date. The end of this day is for the person to do something for peace. Among other ideas, you can put a white flag in your house, forgive a friend, make a donation, join the world events, share the official page of this day or Imagine John Lennon’s music on social networks or sign petitions that circulate through the internet for peace. CHAPECÓ, BRAZIL: Some activities were made by the Institution Chapecó Criança to celebrate the Peace Day which is celebrated on 21 September. The activities are focused on the Project called “Hands given for Peace.” After this action the children went to the field to fly white kites made by the the institution’s teachers. The kites represent the symbol of the culture of peace, so that good winds bring actions of good to the whole world. And to finish the children received three seeds of sunflower, symbolizing seeds of love, to cultivate actions of: Embrace, Solidarity, Kindness, Expressing Love. FRANCISCO BELTRÃO, BRAZIL:Today, September 21, International Peace Day, students and staff gathered in the courtyard for a moment of reflection. Using ribbons, the colors of the continents were represented and a cry for Peace in the world was raised. CURITIBA, BRAZIL: The International Day of Peace, celebrated this Friday (21), will gather more than 400 people on a walk in Curitiba. Promoted by the Secretariat of Sport, Leisure and Youth, the Walk of Peace will begin at 10 am in Barigui Park. SAO PAULO, BRAZIL: Unipaz São Paulo (International Peace University), School of Transformative Education, designed for the next week a special program called “Dialogues for a Culture of Peace”, in celebration of the International Day of Peace, September 21, in order to reflect about the importance of the theme in everyday life. The special program begins at 6:00 pm on Monday, September 17, with the free practice of Meditation entitled Connection to World Peace. On May 18, at 7:30 p.m., Unipaz Vice President Nelma da Silva Sá, Unipaz Facilitator Andrea Duque and guests will hold a live on Culture of Peace entitled “Living in Peace is Possible?”. The event will be broadcast live on the Unipaz Facebook page . FEIRA DE SANTANA, BRAZIL: In Feira de Santana, the International Day of Peace was celebrated in the Marcus Morais Space. An action of the Fair Campaign calls for Peace, the act brought together the community, municipal and state schools, as well as authorities and civil society entities. The municipal secretary of violence prevention, Pablo Roberto, explained that the campaign has a vast program and all actions are based on the discussion about the need for a culture of peace in the city. The event featured white balloons and many people dressed in white. SANTA MARTA, BRAZIL This year’s International Peace Day event in the community is bringing the discussion of how important peace in the favelas is. The president of the NGO Atitude Social, Pierre Avila, told the Voice of Communities: “I expect more love, less arms, to end discrimination and prejudice. We are all children of the same Creator.” The resident and artist Juanita Costa, will exhibit her works of art. Although she currently lives in Los Angeles, she always visits Brazil to develop artistic activities with the children of the NGO. In addition to Juanita’s presence, the event will feature a music school and an integrated arts workshop. ITAJAÍ, BRAZIL: On Friday (21), when the International Day of Peace is celebrated, the students of the Basic School Professor Judith Duarte de Oliveira will perform an action from 1:30 p.m. to 4 p.m. on Hercílio Luz street, opposite to the Historical Museum. They participate in the Project “Sowers of Peace: United to Make a Difference”, which is developed in the school. One of the programmed activities is the Pinwheels for Peace project. Will they be planted? weather vane in various regions of the city, with messages on peace, anti-bullying, non-violence, among others. “They will be placed in the municipal gardens as a public statement of the search for a Culture of Peace ?, explains Professor Patrícia Regina, adding that the wind will spread thoughts and feelings about peace for the whole country and the world. VITÓRIA, BRAZIL: Students at the Centro Educacional Leonardo da Vinci produced a mural for respect for differences among peoples, through generosity and a careful look at the other. Each group worked with a continent, painting butterflies with the colors of the flags of each country, but these butterflies are not restricted to their borders, joining on the same planet, showing that although we have different colors and flags, we are similar and have a same heart. CRICIÚMA, SANTA CATARINA, BRAZIL:A big collective hug was held on the afternoon of last Friday (September 9) in Criciúma to celebrate the International Day of Peace. The action was part of the III Meeting of the Hands-for-Peace Project promoted by the CPMA of the Criciúma region in partnership with the State Government, the State Department of Justice and Citizenship, the Santa Public Prosecutor’s Office Catarina and the Judiciary of Santa Catarina. The project seeks to promote reflection on the construction of a less violent society based on initiatives that promote a culture of peace. In the opportunity also was inaugurated a billboard in the side street to the Forum, highlighting the campaign with the message “For the victims of all forms of violence, our fight for peace”. The event was attended by CPMA partner institutions such as the City Hall of Criciúma, 9th Battalion of the Military Police, Civil Police, 28th GAC, Red Cross, Fire Department, General Institute of Skills, Civil Defense, neighborhood associations, churches and schools in the region, among others. 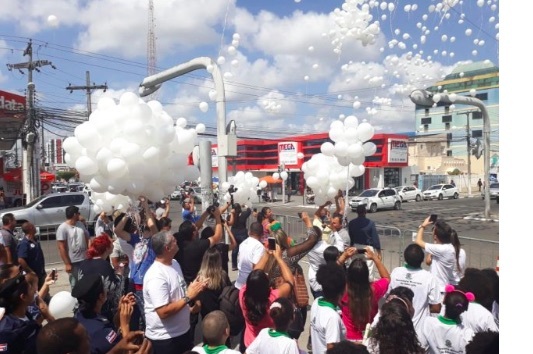 ITAJAÍ, BRAZIL: An event in celebration of the International day of Peace, included artistic presentations on the theme, recitation of poetry, distribution of white balloons, face painting, tree seedlings distribution and 1500 Pinwheels with messages of peace in the gardens of our city. There was also distribution of the “Peace Sowers Newsletter”. With a monthly circulation of 3000 thousand copies with 12 pages, and also in the digital format, the “Peace Sowers Newsletter ” addresses several topics in the sections on Quality of Life, Health, Family Space, Ecology, Sustainability, Interviews with Inspiring People, Traveling in History with Peacemakers, UN News, and a wide range of knowledge and information to add to these, and that contribute to the individual and collective good, benefiting as many people as possible and promoting the Culture of Peace. The event was in front of the Historical Museum of Itajaí, in the center of the city. TIBÚ, COLOMBIA: The celebration of the International Day of Peace took place on Saturday, September 29 at the school in the village of Caño Indio with a Eucharist, bazaar, sale of meals, lightning football championship, presentation of musical groups and cultural activities. BOGOTA, COLOMBIA: Bogotá celebrates the International Day of Peace with symbolic exhibitions, talks with the public, concerts, gastronomic events and fairs with products produced by victims of the armed conflict. One of the most outstanding exhibitions will be at the Center for Memory, Peace and Reconciliation where the monolith that serves as a welcome to the Center is clothed since yesterday afternoon by 1,200 meters of fabrics with stories of peace , reconciliation and memory. These have been woven by victims of the armed conflict and citizen organizations. Virgelina Chará, representative of the Union of Costurers, coordinator of the Asomujer Foundation and in charge of the construction of the loom, explained that “Covering the monolith of the Memory Center is a way of claiming rights. Today we are talking about peace, but what we are doing is for it to be spoken from another language: from the embroidered memory, written, cooked, sung and traditional medicine “. SANTA MARTA, MAGDALENA, COLOMBIA: “Act for Peace ! : Peacemakers – Words + Actions” is an event in the framework of the Celebration of the International Day of Peace, where the community of Magdalena University is invited to be agents of change of our territory. LA PAZ, CESAR, COLOMBIA: In the framework of the International Day of Peace the United Nations Organization , with the support of the Government of Cesar, planned for today a gastronomic day called “Master Chef Por La Paz”, inspired by the famous reality Master Chef. During the activity to be developed today in the Territorial Space of Training and Reincorporation of the ex-combatants, it is expected to have the presence of recognized figures of folklore and national entertainment such as the Mono Zabaleta, Omar Murillo and his wife Koral Costa, as well as the cooks of important restaurants and hotels in Valledupar. Competing teams are made up of ex-guerrillas , the community, the public force and the institutions, according to the Peace Adviser of the Department of Cesar, Jesualdo Hernández Mieles. DABEIBA, ANTIOQUIA, COLOMBIA: Some 150 ex-combatants of the FARC guerrillas commemorated yesterday in the municipality of Dabeiba (Antioquia) the International Day of Peace with the purpose of “living without hatred” and continuing to build the “roads of peace”. In the Llano Grande farmhouse, where there is a Territorial Training and Reintegration Space (ETCR), ex-guerrillas, Public Force and civil society participated in an event led by the UN that reaffirmed the commitment to work on reconciliation. “This is a historic moment, some 15 years ago it was impossible to think of such a moment, and today we all come together for peace,” said Isaias Trujillo, who served 47 years in the Farc. The singing of the children of the school Laura Montoya, who interpreted the song Paz, Paz, Paz of the singer-songwriter Juanes, painted of optimism and hope an activity that also included the presentation of the Philharmonic Orchestra of Medellín and that was the stage of the presentation of the Alliance of Foundations for Reconciliation. This initiative developed by 10 business and social foundations seeks to strengthen specific programs in the area, to work on reconciliation with training and the planting of gardens, among other actions. During the celebration, in addition to recognizing that the implementation process “requires time and patience -according to Trujillo- to reach a successful conclusion”, the advances made in the reintegration were highlighted. For the mayor in charge of Dabeiba, Lina Valle, in that territory they not only talk about peace, but “we are building and living”. BOSA, COLOMBIA: The celebration of the International Day of Peace takes place September 21 and 9:00 in the Plaza Fundacional. MEDELLIN, ANTIOQUIA, COLOMBIA: Organized by the Fundación El Sol, the International Day of Peace was celebrated with different rhythms and dances in the Parque de las luces. SAN JOSE, COSTA RICA: To commemorate the International Day of Peace, a group of foundations allied with the Municipality of San José and the Ministry of Justice organized a walk starting at 8 in the morning from the Parque de las Garantías Sociales to the Plazoleta de la Soledad. The organizers urged those who participate in the activity to wear white garments, as a symbol of peace. CIEGO DE AVILA, CUBA: A meeting was attended by social communicators from various sectors of the territory of Avilanian and representatives of the Cuban Institute of Friendship with the Peoples who repudiated the military bases of the United States. “To contribute to generating a broad international movement that makes peace and the survival of humanity its central objective, constitutes a moral imperative and a political commitment of Cuban communicators that we will not give up in any circumstance,” said Sierralta González, President of the Cuban Association of Social Communicators. HAVANA, CUBA: The second international seminar on realities and challenges of Latin America and the Caribbean as a zone of peace took place September 19-21 at the “Raúl Roa García” Higher Institute of International Relations. Sponsors included the World Peace Council and the Cuban Movement for Peace and the Sovereignty of the Peoples, with co-sponsorship of the Higher Institute of International Relations and the Martin Luther King Jr. Center. Panels were on the following themes: – Current U.S. Policy toward Latin America and the Caribbean: Consequences for Peace – Social Inequalities, Gender and Ethnic Minority Issues: Challenges for Peace – The Environment, Natural Resources and Challenges for Peace – Imperialist Information and Communications Technologies and their Provocations to Peace – Importance of Latin America and the Caribbean as a Zone of Peace. SANTO DOMINGO, DOMINICAN REPUBLIC: The Ministry of the Interior and Police (MIP), through the Vice Ministry of Social Management and Citizen Education, encouraged the participation of 75 young people in the seminar “Construyo Paz RD”, on the occasion of the celebration of the International Day de la Paz, on September 21. The presence of this group of young people, belonging to the sectors involved in the Vivir Tranquilo program, was supported by the Minister of the Interior and Police, José Ramón Fadul, and was organized by the “Cultura de Paz Network of the Dominican Republic”, a space that integrates different public, business and civil society organizations with the purpose of sowing in the youth knowledge and values ​​that impel them to develop a culture of peace. This seminar was born as an initiative coordinated by the Center for the Study, Prevention and Resolution of Conflicts (CEPREC), with the objective of empowering youth leaders who can promote in their sectors the construction of peace, through respect for Human Rights, tolerance and good behavior, for the prevention of violence and conflicts, and in that way guarantee an atmosphere of peace and security in communities throughout the country. ITCHIMBIA, QUITO, ECUADOR: We are here in Itchimbia Park this Saturday September 22 to cultivate a family and collective space and commemorate the International Day of Peace that is celebrated on the 21st. We decree to the world and to us same that we are here for Peace. That in Ecuador, Latin America and the whole world, we are many and more and more people that actively take steps with confidence and say, We want Peace! in the present and for the future. For our life and the next generations. For our relationships, our Mother Earth and our hearts. GUAYAS, ECUADOR: With an open house to inform citizens of the benefits of the Justice of the Peace, the Provincial Directorate of the Council of the Judiciary of Guayas celebrated the International Day of Peace as “a call to hope that one day of peace may lead to another. The president, Gabriel Manzur, said that since 2014, the Judiciary has participated in the community designation of 13 Judges and Peace Judges in 16 parishes, promoting in this way justice services to citizens living in rural areas of the country. Víctor Carranza, Justice of the Peace of the Cone parish in San Jacinto de Yaguachi, indicated that significant progress has been made in his community in the interests of better coexistence among the neighbors, because the conflicts have been overcome through dialogue. There have been seven educational centers of the Fe y Alegría network in the province of Guayas, which have participated in the “Seedlings of Coexistence” program, with workshops held both for students and parents, in which the problems were analyzed of their community and alternative solutions with practical tools so that dialogue becomes the fundamental mechanism to resolve conflicts. GUANAJUATO, MÉXICO: International Day of Peace Celebration with Workshops and Music for Children in collaboration with 58 International Children´s Festival from Sibenik Croatia, World Art Games Organization, Art México, Art Spirit Community and Museo de Arte e Historia de Guanajuato. IRAPUATO, MEXICO: Peace groups from Jalisco, Chihuahua and Michoacán, as well as different clubs and civic associations such as the Union of Clubs and Associations of Irapuato (UCADI), the Lions Club and the Board of Kings Cavalcade joined in a walk for peace. They held cardboard signs and blankets with various messages of peace such as; “High crime, more attention to the disabled … enough deaths” and “we are tired of so much corruption” was how the peace walk began, leaving the park Irekua .The walk traversed Guerrero Avenue and more people joined the contingent as it progressed its way bound for the Plazuela Miguel Hidalgo. NAVOJOA, SONORA, MEXICO: All students at the primary and secondary levels were invited to submit posters for the International Day of Peace. Activities on that day included a march of students wearing white clothing from the Plaza 5 de Mayo to Plaza Santa Fé Springs, where the Museo Regional del Mayo is located . Organizers included the Municipal Government through the Directorate of Education and Culture , in coordination with Amigo de los Museos , Cultural Association, Nabojowa Mission Intercultural Civil Association and Yolem Tekia Cultural Center. METEPEC, MEXICO: The International Day of Peace was celebrated by the Ignacio Zaragoza” primary school for the benefit of 567 students, the José Palacios Rojas High School and the Bertha del Avellano de Cárdenas Children’s Garden. NUEVO LEÓN, MEXICO: The State Government will hold on Sunday, September 30, the Walk for Peace and Nonviolence to celebrate the International Day of Peace. The purpose of this event is to raise awareness among the population of returning to values ​​and regenerating the social fabric, said Ervey Cuéllar Adame, Undersecretary of Prevention and Citizen Participation. The Walk starts at 9:00 from the Alameda and goes to the Government Palace. Participants are asked to wear white clothing, symbolizing peace. In the end, through songs and dances, gang members will send messages of peace and nonviolence. MONTERREY, MEXICO: On the occasion of the International Day of Peace (September 21) and the International Celebration of Nonviolence (October 2), the Undersecretary of Prevention and Citizen Participation ,Ervey Cuellar, called for a walk wih the objective of promoting peace and aborting the violence. He affirmed that the event will be carried out to exhort the population to recover the values ​​of dialogue, tolerance, respect and healthy family coexistence. “We want to strengthen the social fabric, to collaborate in all this problem that we are living and to promote peace and tranquility,” said Cuellar. ZACATECAS STATE, MEXICO: The International Day of Peace was celebrated with the ringing of bells in all the Catholic churches of El Mineral. The churches that joined the celebration when the bells rang for three minutes were Our Lady of Purification, Saint Anne, Sacred Heart of Jesus, Saint Joseph Worker, Our Lady of Refuge, Saint Peter and Saint Paul, Saint John and Divine Providence. In addition to Fresnillo, other communities also participated, including Plateros -with its seven churches located in ranches and within the community-, Ábrego, Colonia Mariana, Rancho Grande, San José Station, San José de Lourdes, La Salada, Vallecitos Plan, El Aterradero, La Enchanted and Trujillo. The priest Jesus Arteaga, known as Father Chuzo, reported that the churches of the Cañitas de Felipe Pescador municipality also participated. Meanwhile the audiovisual media of El Mineral transmitted the Hymn to Joy , as part of the commemoration of the International Day of Peace, under the slogan the Right to Peace. SALTILLO, COAHUILA, MEXICO: In coordination with the group of children Commissars and Environmental Inspectors, of the Pueblo Insurgentes Community Center, the DIF (Sistema Nacional para el Desarrollo Integral de la Familia) commemorated the International Day of Peace on Friday, September 21, with the presentation of the work “La Ruta del Escarabajo” (The Route of the Beetle) by Mayte Olvera, with the support of the Municipal Institute of Culture. At the event, the participants expressed the desire and importance of living in a peaceful society, where equality and justice are available to all girls and boys. The activities culminated on Friday afternoon with the Hymn to Joy, which generated an emotional and fraternal atmosphere that all families enjoyed. GUADALAJARA, MEXICO: Every year on the Sunday closest to September 21 in the Chapultepec walkway of Guadalajara, the organizations that make up the C-Paz collective exhibit some of the activities they carry out in favor of building Peace. On this occasion the organizations participating in this event were: Meditapalpa, Gises, Oblate Educational Center, Creapaz, Spokespeople for Peace, Amnesty International, Schools of Forgiveness and Reconciliation, Conscience and Action Mexico, FM4, Community Grows, Voices ITESO, CISV Mexico, DHAVYNA, Four Winds, etc. The activities of these organizations range from peace education for girls and boys to discussion forums for adults and from art for peace to the creation of micro-enterprises for young people and for women heads of family. MANAGUA, NICARAGUA: Boys and girls want Peace, the members of the Rubén Darío Student Choir of the II district of Managua, sang in an angelic voice during the celebration of the International Day of Peace, at the San Sebastián Public School. “Peace, represents the love and tolerance that we must have to live in a better world, ” said Ángel Gabriel Ruíz , sixth grade student. LIMA PERU:The Friends of the UN Club of La Libertad celebrated the International Day of Peace 2018 “The Right to Peace and the 70tth anniverary of the Universal Declaration of Human Rights.” EI No. 80076 “Millennial Chan Chan” held learning sessions in each of the grades, called “La Paz Nace del Corazón”, and the pupils then expressed themselves by forming a great heart of children who yearn for peace and the love of all. MAYAGÜEZ, PUERTO RICO: In honor of the International Day of Peace PeaceCast.tv will broadcast PeaceCast Global, with videos that promote peace. This year, for the first time, it will be broadcast simultaneously in English and Spanish. The Spanish version will be launched from the Mayagüez University Campus of the University of Puerto Rico. “For us at the College of Mayagüez, it is a great privilege to be part of this historic event that aims to raise the figure of peace as a center for our daily life. We are convinced that education is an integral part of the knowledge, in full, of the benefits, both of peace at the individual and social level and of the people. That is why we are honored to collaborate with this emblematic transmission that will be seen around the world, “said the interim President of the UPRM, Wilma L. Santiago Gabrielini. LAS MERCEDES, VENEZUELA: Saturday, September 22nd, the Venezuelan American Center of Zulia (Cevaz) will hold a concert in commemoration of the International Day of Peace at the headquarters of this institute in Las Mercedes with the presentations of the Extra Various musical groups, Bento and Mr. President . This will be an event dedicated to fostering the ideals of fraternity, tolerance and understanding in all nations and peoples. In this context, music will serve as a perfect link to move closer and cross borders. ALTAMIRA, CARACAS: On the occasion of the celebration of the International Day of Peace , this Sunday in Pdvsa La Estancia , in Altamira, Caracas, a concert was held for Human Rights and Peace in Singing and Poetry with the poetic group Una Sola Brasa and the group Piakoa. The ombudsman Alfredo Ruiz Angulo, pointed out that together with PDVSA La Estancia, the Ombudsman’s Office celebrates this day with the builders of peace. Ruiz added that participants included representatives of various communities in Caracas, such as the foundation of the deaf, representatives of peasants, women, fighters and fighters for peace, among others. CARACAS, VENEZUELA Venezuelan President Nicolás Maduro highlighted the fact that the people of Venezuela are overcoming their difficulties peacefully in connection with the commemoration of the International Day of Peace, established by the UN since 1981. Through his account on the social network Twitter, the head of state ratified the path of peace as a way to achieve emancipation. ‘The heroic people of Venezuela have managed to overcome their difficulties peacefully. On this International Day, we confirm that it is the only way to achieve true freedom. With Peace everything is possible, “the president wrote.